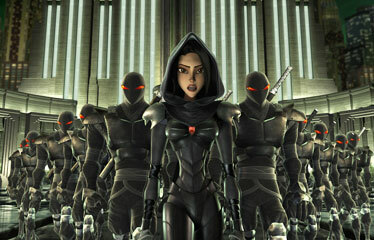 Karai (voiced by Ziyi Zhang) was the leader of the foot soldiers. CGI helps entertaining heroes on the half shell to fight evil beneath NYC in "TMNT"
One approaches a new Teenage Mutant Ninja Turtles movie with a certain amount of forbearance. Is this some sort of pathetic last gasp to revive a franchise that was already dead on arrival nearly two decades ago? Is that how long it takes to wash it out of the minds of America's cultural consciousness? Dude! This has been dead so long it no longer smells! Ah, but the world has rotated and changed since the characters' heyday. Rubber suits are a thing of the past. The password for today is "pixel." A story about four mutated turtles who live in a New York sewer and practice ninja arts with skateboarder glee -- well, that's just crying out for CGI. 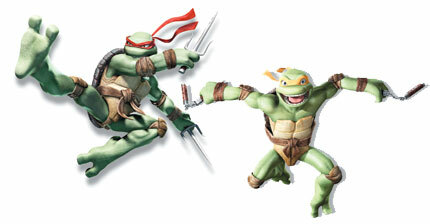 The Turtles have already had a faint revival as an animated series. The comic book's original creators, Kevin Eastman and Peter Laird, are on hand to make the story authentic, if that's the word. The tale here, in the fourth movie, is that the Turtles are drifting apart in an enforced hiatus after the defeat of their arch enemy, the Shredder. They're goofing off instead of saving the world. But! -- you knew there'd be a but! here, didn't you? -- rogue zillionaire Max Winters has been reviving ancient stone warriors and capturing monsters (who all seem to live in New York), and it has something to do with planetary alignment and a 3,000-year-old curse. April and Casey and Splinter and Karai and the Foot Clan (Turtleers know who they are) are also on hand to lend a human and mutated-rat element. All of which leads to much jumping around and martial-arts head cracking, with the fate of the world at stake. It's about selling toys, not telling a story. Like the animated series, the dramatic focus is on Leonardo (the brooding leader Turtle) and Raphael (the hot-blooded malcontent Turtle) while the other two Turtles (Warhol? Picasso? Matisse?) are pretty much ignored. It's still hard to tell them apart. The subtext of the plot is that we all need family, even mutant turtles and ancient stone statues. This point is hammered constantly, with the finesse of a railroad spike bashed through a head of lettuce. The good news is that the movie is consistently entertaining to look at and listen to, albeit on the level of a well-crafted video game. The art design by Simon Murton is a chiaroscuro pastiche of giddy Hollywood Egyptiana and art deco elements, while the score, by Klaus Badelt, is a paean on tom-toms to the action-adventure genre. The voice work features Sarah Michelle Geller, Patrick Stewart, Ziyi Zhang and Lawrence Fishburne, as well as the great Asian actor Mako as Splinter, who apparently recorded his vocals one day and dropped dead the next (really! ).